You finally did it. You created an email list. 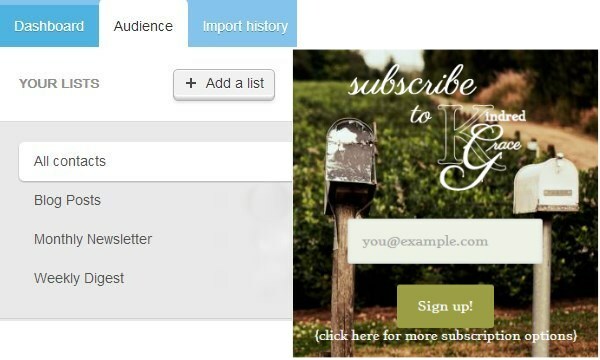 You even sent out your first email newsletter to your brand new subscribers. But now you have two different subscribe widgets on your site. And when you ask a reader if they’re subscribed to your newsletter, they think they are, but they’re not sure—they’ve been getting your posts via email for a year now. And judging by the way subscriptions are going, you’re pretty sure that half your visitors are subscribing to your newsletter, while the other half are already subscribed to your posts by email and assume there’s nothing else for them to subscribe to. Your subscriptions are effectively split down the middle and you feel like you’re losing ground rather than gaining it with this newsletter thing. Friend, it’s time to simplify your email lists. 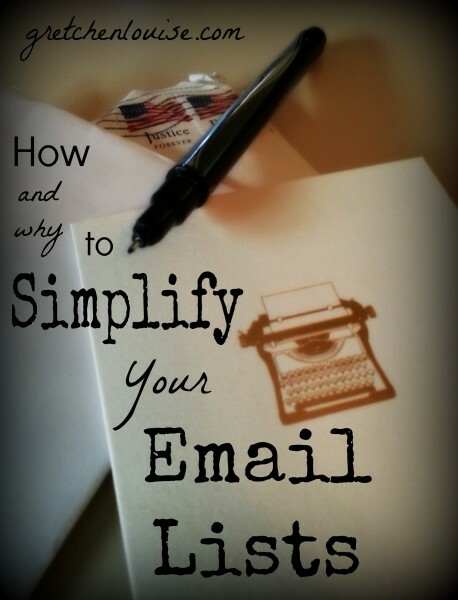 Why should I simplify my email list? A. Merge multiple calls to action into one clear call to action: subscribe. 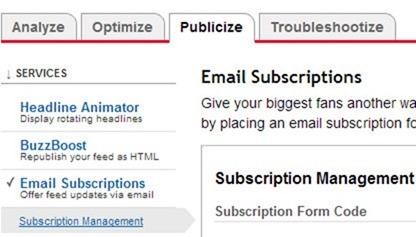 Rather than having multiple subscribe boxes and buttons throughout your site, consolidating your email lists means you can have one subscribe box with one subscribe button. No more splitting your subscriptions and overlapping your numbers: consolidating your email list gives you an accurate count of how many email subscribers you have. B. Providing a clear explanation of the different options available within one subscription makes it easy for your subscribers to know what they are subscribed to. 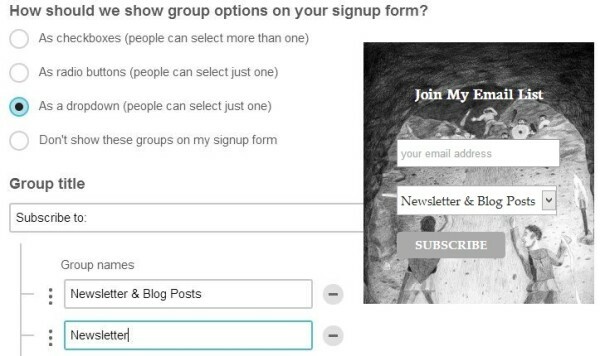 With multiple groups in one list your subscribers will be able to update their subscription options quickly and easily. They won’t be aggravated when they change their email list on one of your lists but it doesn’t carry over to the other. They won’t mark you as spam when they unsubscribe from one of your lists only to receive an email from another of your lists the next day. 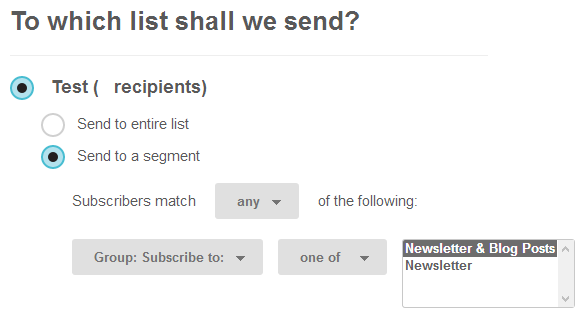 With a consolidated email list, it’s one click to see what they’re subscribed to and when they’ll receive it. C. RSS to email services like MailChimp and Mad Mimi give you endless customization and branding options for sending your blog posts via email. But with MailChimp or Mad Mimi, you can add your social media buttons to the bottom of each email, put in a special note or coupon code just for your email subscribers, schedule the exact days and time of delivery, not to mention add your own custom banners, color themes, and subject lines. Want to give your subscribers the option for daily delivery or weekly digest? No problem. You can do it all and more with the free services MailChimp and Mad Mimi provide. Won’t it cost a lot if I start sending all my blog posts through a service like MailChimp or Mad Mimi? That’s what I thought, too, until I started doing the math. With MailChimp (my service of choice), I could send anywhere from 6 emails per month to 2,000 subscribers, to 15 emails per month to 800 contacts, to 31 emails per month to 387 subscribers. I don’t write 31 posts per month. And I don’t have 2,000 subscribers. I fall enough in between those numbers that I’m not worried about having to fork out money for my subscription service anytime soon. And when I do hit 2,000 subscribers, I hope I’m making enough from my blog that I can afford the $30 per month for unlimited emails to 2,500 subscribers through MailChimp (or I could switch to Mad Mimi where it would be $16 per month for unlimited emails to 2,500 subscribers). I don’t have 2,000 subscribers, but I’m close enough that I’ll have to pay if I send out an email for every post–what do you suggest? If you don’t want to pay for unlimited emails, the simplest option is just to offer a weekly digest. Increase your social media shares of your posts on the day you post them, educate your readers about RSS feed readers like Feedly and Bloglovin’, and just send them an email with the highlights from your blog once a week. You’ll even have an extra email or two per month left to send out a newsletter. I’m moving from WordPress.com to WordPress.org—would this help me keep my Jetpack subscribers? 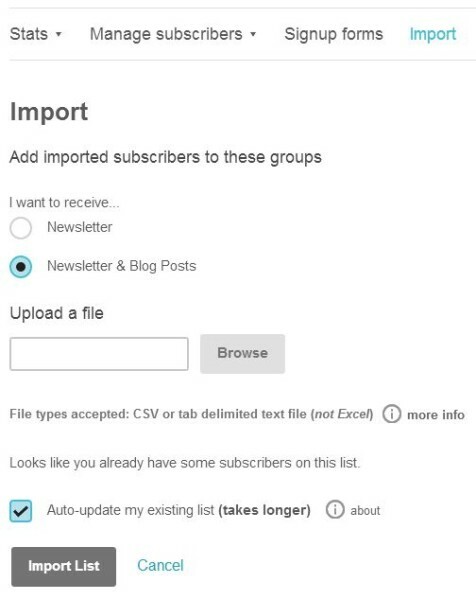 Yes, importing your WordPress.com email subscribers into an RSS to email group in MailChimp or Mad Mimi is the best way to keep from losing your subscribers, since Jetpack doesn’t give you any import options (unless you pay for their guided transfer service). Can I still have that checkbox at the bottom of the comment form giving commenters the option to click to subscribe like with Jetpack? Yes! There are multiple plugins that provide this option. My favorites are MailChimp for WP and Mad Mimi for WordPress. 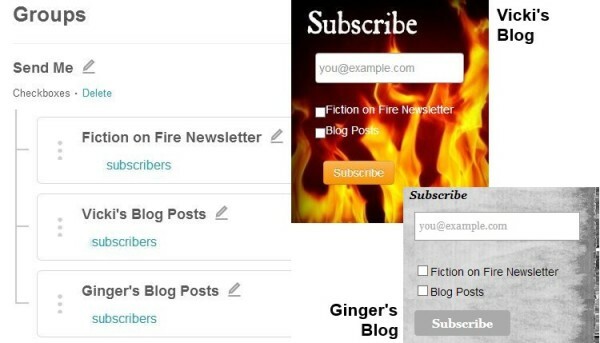 Wait—is FeedBurner really going to disappear? Do I still need to write a separate newsletter even if my blog posts are going out via email? Yes, a newsletter is still one of the best ways to connect more personally with your readers! If in doubt, check out Trina Holden’s post over at the Allume blog: Why Every Blogger Needs an Email Newsletter. Why have other bloggers simplified their email lists? What kind of options can I give my subscribers? Sometimes, the ability to choose what fits your subscriber the best will make the difference in them clicking that subscribe button. Offer flexible group options (they’re called lists in Mad Mimi) when they subscribe so they can choose what they want to receive and when they want to receive it. How do I simplify my email lists? It’s pretty easy! Just follow these six steps to simplify your email lists. 1. 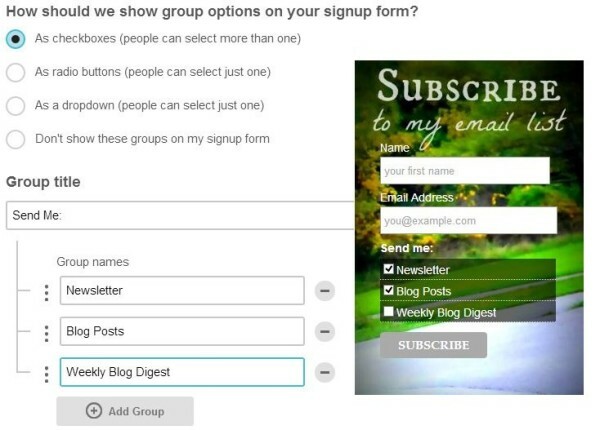 Create a new group for your blog post recipients. 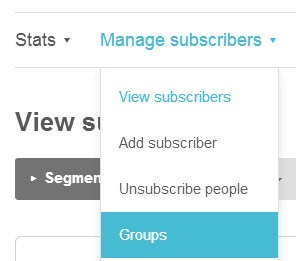 In MailChimp, choose your List, click the “Manage Subscribers” drop-down, and choose “Groups”. There you’ll have the option to click a “Create Groups” button. Add yourself to your new groups or lists, but don’t import anyone else yet! 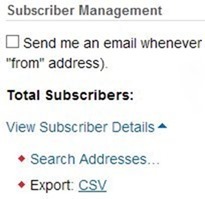 Tip: If you want to give your subscribers multiple options as illustrated above (weekly digest, etc. ), this is the time to add those groups as well. Mad Mimi does not allow multiple RSS to email campaigns for the same feed, so if you want both daily and weekly blog post options with Mad Mimi, you’ll need to trick it with a secondary feed address like FeedBurner or FeedBlitz to create more than one RSS to email campaign from the same site. 2. Set up your RSS to Email Campaign. 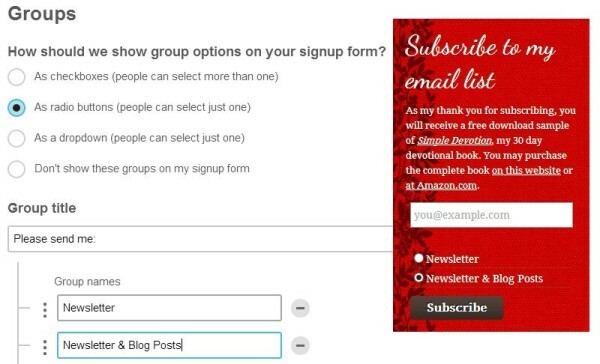 MailChimp: What is an RSS to email campaign and how do I set one up? Mad Mimi: How Do I Set Up RSS to Email? Test your campaigns thoroughly while you’re still the only recipient! 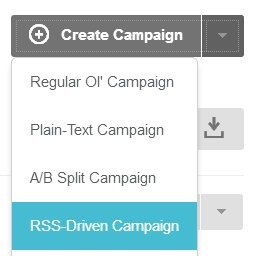 Tip: You’ll need to create a separate campaign for each frequency option you created a group for above. Like FeedBurner, MailChimp and Mad Mimi will send out your posts at a specific time each day or week, if and when there are new posts. 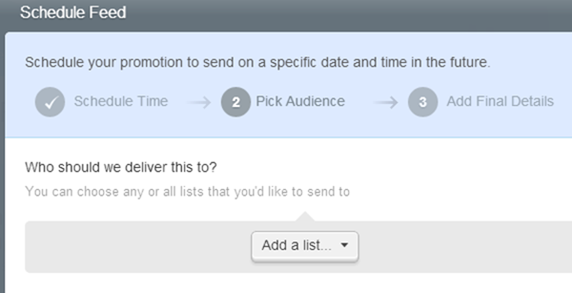 If you’d like an email sent out as soon as you post (like Jetpack), try MailChimp’s AutoChimp plugin. 3. Download your email list from FeedBurner or Jetpack. 5. Deactivate email service with FeedBurner or Jetpack. 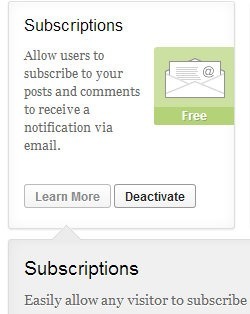 Tip: Deactivating Jetpack subscriptions also deactivates any comment subscriptions. Try Comment Reply Notification or Subscribe to Comments Reloaded to replace this function with even more features. 6. Schedule RSS to Email Campaign. You’re all set! Double check all the settings in your campaign(s) and, if you haven’t already scheduled them, press the appropriate button to start sending out your blog posts via email. Congratulations! You did it: you simplified your email lists. Comment and let me know how it goes! Or if you’ve already consolidated your lists, I’d love to hear how it’s working for you. I use mail chimp. Should I make a new list for every new lead magnet? For instance, I have my main VIP list where subscribers automatically get my free download, which is great. But I ran into issues when I created a brand new list for an upcoming webinar. I found it annoying that I had to wait 7 days after sending a campaign to merge my lists. I want to run a free email challenge to anyone who opts-in, but I want them to automatically be added to my main email list as well! So basically in a nutshell … how do I manage all these different opt-ins for lead magnets, webinars, and free email courses with mailchimp? 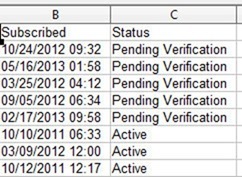 Do i create multiple lists then wait the 7 days? I’m Jeremy, and I work on the Jetpack team. Great post! I just wanted to add one small remark, since you mentioned Jetpack in the post. Jetpack doesn’t give you any import options (unless you pay for their guided transfer service). 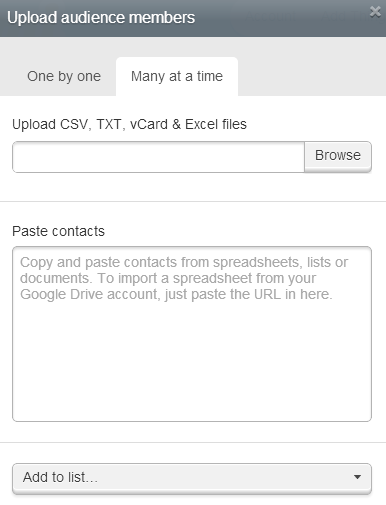 It’s actually possible to transfer your WordPress.com followers from your old WordPress.com site to your new self-hosted site by following the instructions here. So you don’t have to give up on Jetpack just yet 🙂 (unless you don’t like having your posts sent to your subscribers immediately after publishing, as you mentioned). I understand that you can migrate WordPress.com email followers to WordPress.org, however, you cannot import email followers from any other service into Jetpack. Thus, if I was using Feedburner or MailChimp, I couldn’t move to Jetpack–only from Jetpack. To me, that seals the deal, even though Jetpack subscriptions are a great starting point for beginning bloggers. That’s indeed a pain-point, and that’s currently on our to-do list. You can follow our progress on this problem here. I added your vote to the issue! Okay Gretchen, I may need some major coaching on this one… I want to put a photo (or something) behind my email sign up. Now, I get how to embed the form code and I see in Trina’s (I’m inspecting her elements 🙂 ) style code where the photo is, but I have no clue how to put that all together myself. Help!! How do you add an image as the background for your subscription box? Can you do that with the free version of mailchimp. Oh cool! I’m going to give it a try. So, if I wanted a specific image, would I just add an image to the style area? Like I do on a website? This was so.o.o.o.o helpful. And I think I read it thrice to make sure I followed each step! Thanks for the extra help, Gretchen!